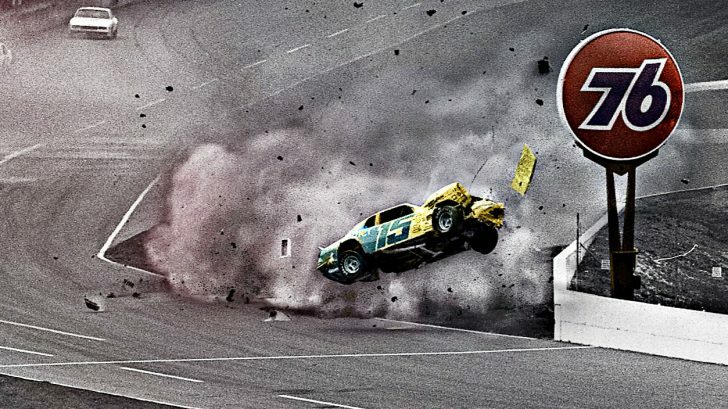 “The Big One” is a term that developed out of necessity – when horrifying crashes would ensnare more than just a couple of cars on the NASCAR track. Since its inception, this has become one of the main attractions of the sport – the thrill of watching an insane wreck, but hoping that nobody got hurt in the midst of it all. Some of the biggest crashes throughout NASCAR’s history have been completely miraculous, and others incredibly devastating. To highlight some of the most wild and unbelievable crashes to happen on a NASCAR track, we have compiled a list of crashes that will completely blow your mind. Out of respect and good taste, we have chosen to exclude any incidents that ended tragically, or that involved grievous bodily harm. This list, while not complete, highlights some of the amazing strides in safety that the auto racing industry has made in the last six decades and, also, many of the dangers of being a driver in the sport. Check out these 10+ worst NASCAR crashes in history below and let us know what you think in the comments! One of the absolute “biggest” crashes in NASCAR history (by the sheer number of cars involved), this early-motorsport event saw 37 cars get tangled up in a race that featured 68 total entrants. Bill France actually kicked off this race as the pace car driver during the beginning years of NASCAR. While everything seemed to go smoothly, drivers got into some trouble on the fourth turn which ended up taking out more than half of the field. Everyone walked away from this accident. Occurring on the famous tunnel turn at Pennsylvania’s Pocono Raceway, “The King” Richard Petty lost his right tire mid-race and was sent barrelling helpless into the outside wall. As the video footage shows, he then spun around, having a near miss with Buddy Baker and Chuck Bown both sliding right past him – the worst of it is yet to come. In just a split second after Bown whizzes past him, Darrell Waltrip comes flying toward him and crashes directly into the driver’s side of his car. Unfortunately, with a broken neck, this spelled the downturn of his career. This crash is one that nearly everyone who was watching will remember today, and surely is one for the record books. Coming out of turn four at Daytona for the 1984 “Clash,” he got loose on the track and caught some air as his car sped straight toward a 76 petrol sign. Going airborne, Ricky Rudd and his No. 15 Bud Moore Ford nearly smashed straight into the inside fence, but narrowly avoided it. Not only did Rudd walk away from this incident with just a concussion and swollen eyes, but he competed in the following race by taping his eyes open – that’s some serious devotion! Shortly after this wreck and Rudd’s undying commitment to racing, NASCAR began implementing more safety and wellness requirements – including examining and medically-clearing drivers to compete after they sustained an injury. Only 20 laps into the race, NASCAR legend Bobby Allison blows not only his motor, but one of his tires as well, and goes flying into the catch-fence in a moment that would change racing forever. Many have said that they’re amazed Allison ever got back on the track following this terrifying incident, and he not only got back behind the wheel, but took home top marks at the very next superspeedway race. This crash, in which Allison was recorded at 212 mph, caused NASCAR to mandate restrictor-plate racing from this point forward. The younger Waltrip brother completely destroyed his Busch Series Pontiac in this wild and horrifying crash with a cement wall. After making contact with Robert Pressley, Michael Waltrip caught a gate that was used to let cars on and off the track. After striking the gate, his car shot straight into the end of the cement wall and collapsed in on itself. Many feared that Waltrip had not survived the ordeal, with his brother Darrell rushing to the scene. Luckily, Waltrip walked away with just cuts, soreness, and bruises from the incident. The second time appearing on this list, Darrell Waltrip had just come off of his second win of the season when he tore up the infield at Daytona. A chain of contact points pushed Waltrip into Joe Ruttman’s car, sending them both veering toward the infield at close to 200 mph. Waltrip’s tires clipped the edge of an access road which forced it into the air and he began tumbling side-over-side and coming to a stop upside down. Teams were able to extract Waltrip from the car and discovered he only suffered minor injuries – even though slowed-down footage showed his arm was outside the window while the car was tumbling across the field. During the very first Daytona 250 Truck Series race, Geoff Bodine found himself in one of the worst situations imaginable – and one that nobody expected him to walk away from. Kurt Busch, a rookie at the time, caught another driver on the 57th lap that ended up swerving into Bodine. This chain reaction shoved his truck straight up into the retaining wall, going airborne and shooting him into the catch-fence. Going more than 190 mph, Bodine’s truck almost disintegrated on impact and ruptured the fuel tank in a fiery ball of molten metal that left just the roll cage intact. Miraculously, Bodine suffered several minor fractures of the wrist, cheekbone, ankle, and one vertebra in his back. Nine bystanders were injured from the debris, but all made full recoveries. At more than 100 mph, driver Larry Foyt drove straight into Steve Park’s car as he lost control at a very unfortunate moment. Park’s car appeared to veer straight out into the track and right in front of Foyt, but the reason behind it was that his steering wheel had come off. After this t-bone collision, Park was left with a massive brain injury and several broken ribs and was airlifted to the local hospital. This near-fatal crash marked the downturn of Park’s career as he worked to regain footing in NASCAR over the next decade. Coming close to contacting Dale Earnhardt Jr. in this heated race at Talladega, Elliott Sadler found himself in the middle of a vicious crash – one in which his car flipped and spun mid-air, landed on its roof, and then flipped another six times before coming to a screeching halt. By the grace of God, Sadler was able to walk away from this scary crash completely uninjured. In a crash that would force the Las Vegas Motor Speedway to increase the protection and implement safer barriers on the inside of the track, Jeff Gordon jets straight toward the inside wall and slams hard into the fence. His entire front end was disintegrated, but luckily he was able to walk away from this accident. Coming in hot on the final lap of this NASCAR Sprint Cup Series race, Carl Edwards had been expected to give Jimmie Johnson a run for his money this season – but instead didn’t even finish this race. In the lead, Edwards dashed into the tri-oval before turning down into the path of Brad Keselowski and that’s where everything went awry. Edwards’ car spun backward before soaring into the air. A second hit from Ryan Newman, while airborne, shoved him to even further heights and he slammed into the catch fence. Edwards walked away from the accident and even sprinted across the finish line, but eight fans were injured from the debris – with one woman having a broken jaw. The day after Independence Day, young driver Austin Dillon was hit on his left front tire after Denny Hamlin’s spinning car made contact. His car then went airborne and flipped straight into the catch-fence exploding on impact. He walked away from this insane incident, but several fans were injured. Watch his interview about the scary crash below. With all of these wild, unbelievable, and incredibly terrifying crashes throughout the decades of NASCAR racing, and it’s hard to believe that so many times people were miraculously able to walk away from them.